The Spanish Water Dog (perro de agua español) breed dates back several hundred years and has its origins most likely in Turkey from where it was imported into Spain as a general purpose sheepdog and guard. It is also used sometimes as a gundog, and is skilled at retrieval from water. The SWD has strong genetic links to other ancient water breeds such as the Portuguese Water Dog, the French Barbet and the Irish Water Spaniel. The head should be strong and carried with elegance. The skull is flat and the top is parallel with the top of the muzzle. The nose, eye-rims and paw pads are the same colour as the darkest part of the coat or darker. The eyes are expressive and set fairly wide apart. They should be hazel, chestnut or dark brown in colour, depending on the coat colour. The ears are set at medium height on the skull, and are triangular. The SWD can be seen in a variety of colours. It may be solid black, beige, brown, or white; bicolour where the second colour is white; or particolour . Tri-coloured dogs are strictly prohibited by the currently held (worldwide) standards for the breed as are black and tan or brown and tan colour combinations. The SWD is diligent, loyal, affectionate, and intelligent. They have very strong natural herding and guarding instincts, leading them to become the "self-appointed" guardians of their homes. SWDs thrive on work and play. Their athleticism and extremely hard working nature leads them to excel at any number of tasks. They can be wary with strangers, and early and continuing socialization with a variety of people and other animals is essential for a well-adjusted, social dog. Good socialization at an early age greatly helps them cohabit with small children. Nine-week-old SWD brown and white boston coloured puppy. The eyes of these dogs are varied, it can present blue, hazel or brown colors. Ears and eyes should be cleaned as often as they are dirty and excess ear hair may need to be plucked. Many different theories exist as to its origin and history. Records suggest water dogs have been around the main wetlands of the Iberian Peninsula since ancient times. 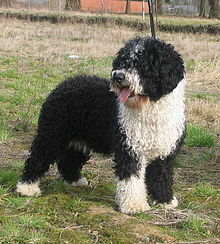 Portuguese and Spanish water dogs are clearly related and have a common ancestor. The SWD has been known by many other names such as "Perro Turco", "Laneto", "Perro Patero", "Perro Rizado", "Churro", "Barbeta", and, most recently, "Perro de Agua Español" (literally Dog of Spanish Water, i.e., Spanish Water Dog). In Southern Spain (Andalusia), the SWD was often called the "Andalusian Turk" and some thought the breed came with Turkish sheep boats, but this is very unlikely since originally there were three separated populations of SWD in Spain with somewhat different phenotypes and sizes. One of these populations was found in Northern Spain, in Asturias and Cantabria, these dogs were usually smaller and of lighter colour, becoming a new breed 22 March 2011, the Cantabrian Water Dog. The other group could be found in the marshes of western Andalusia, this type of dogs had coats made of long and thin cords. And finally the largest group came from the southern Andalusian sierras, this type of dogs were the largest and strongest since were mainly used for herding. Today, the breed is well mixed and most SWD are well rounded and have a balanced of traits. Regardless of its exact origin, a woolly coated Shepherd Dog is documented to have been on the Iberian Peninsula by around 1100 CE. This is clearly a very ancient and rustic breed, very well adapted to the climate and terrain conditions found in the wetlands and coastal mountains of the Spanish shores. Historically, the SWDs were primarily used as Herding dogs to move the flocks of sheep and goats from one pasture to another. The dogs were also called upon to work wherever a dog was required. For example, they were taught to work with fishermen as well as being taught to retrieve when hunting with the farmers. Spanish Water Dogs are highly versatile. This one is herding sheep. In about 1975, two enthusiasts, Antonio García Pérez and Santiago Montesinos, travelled around the countryside of Southern Spain, through the remote villages and farms of the mountainous region of Andalusia and bought or borrowed a number of dogs from the shepherds that they felt most fit the type they were looking for to establish a breeding program. In 1980, the Spanish Water Dog Club (Spain) was formed in order to promote the breed and help get it recognized in its own country. In 1985, after a lot of hard work[opinion] and displaying the breed at various venues and dog shows the Spanish Kennel Club accepted it and gave it official status. It was provisionally recognized by Fédération Cynologique Internationale until 1999, when it was permanently recognized. The SWD was officially recognized in the United States by the United Kennel Club in 2001 and fully accepted for conformation events in 2004. Jerry and Ken Mann were instrumental in facilitating recognition in UKC. They presented the first SWD to be shown in an AKC Rare Breed Conformation venue in Inverness, Florida in January 2000. They presented an Introduction Seminar at a UKC venue in South Carolina in 2001 and showed the first SWD at a UKC Mult-Breed show in the Summer of 2004. They spearheaded the first International SWD discussion list and were the first owners to use their SWD for herding in the United States. They brought the natural ability and historic value of herding to the fore. As of July 1, 2013, the Spanish Water Dog will move into the Herding Group in the UKC. The American Kennel Club Foundation Stock Service recognized the breed in 2005 through the efforts of the Spanish Water Dog Club, Inc. The AKC approved the breed to begin competition in AKC herding, in dog agility trials, obedience, and tracking beginning January 1, 2008. In June 2012, the SWD moved into the Miscellaneous Group. As of January 1, 2015, the Spanish Water Dog will join the Herding Group. Herding instincts and trainability can be measured at noncompetitive herding tests. Spanish Water Dogs that exhibit basic herding instincts can be trained to compete in herding trials. Additionally, the breed was recognized by the American Herding Breed Association in 2007. 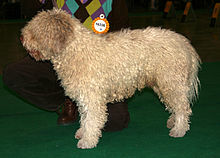 The Canadian Kennel Clubs Listed and Miscellaneous Breeds was amended to include the Spanish Water Dog as a listed breed effective as of 1 September 2008. ^ "Breed Information". Spanish Water Dog Club, Inc. Retrieved 17 May 2012. ^ "Grooming". Spanish Water Dog Club, Inc. Retrieved 17 May 2012. ^ Hahn, Kerstin; Rohdin, Cecilia; Jagannathan, Vidhya; Wohlsein, Peter; Baumgärtner, Wolfgang; Seehusen, Frauke; Spitzbarth, Ingo; Grandon, Rodrigo; Drögemüller, Cord. "TECPR2 Associated Neuroaxonal Dystrophy in Spanish Water Dogs". PLOS ONE. 10 (11). doi:10.1371/journal.pone.0141824. PMC 4640708. PMID 26555167. Cristina D. (2003). Spanish Water Dog. NJ: Kennel Club Books, Inc.
"Health Issues." Spanish Water Dog Club UK. Spanish Water Dog Club UK. Wikimedia Commons has media related to Spanish Water Dog.